An in-app manga purchase unlocks Yoshikawa’s animated Virtual Autograph, which was built with Madefire’s Motion Books technology. Those at Anime Expo who bring their Virtual Autograph to the Kodansha Comics booth (booth #324) will receive an AX 2015 Exclusive Shikishi (signing board), which they can then have Yoshikawa sign at one of her Anime Expo autograph sessions. Miki Yoshikawa will be attending Anime Expo as a Guest of Honor. Her visit is being sponsored by leading anime-streaming site Crunchyroll, with events scheduled for Friday July 3 and Saturday July 4. *INSTRUCTIONS ON GETTING YOUR TICKET TO THE MIKI YOSHIKAWA AUTOGRAPH SIGNING – You must have a ticket to attend! Tickets can be picked up at the Concourse Foyer starting at 8 a.m. on Saturday and will be distributed on a first-come, first-served basis. Early arrival is highly suggested. The start of the line will be outside of the building, and attendees will be led into the hall just before 8 a.m. The latest anime episodes and manga chapters of Yamada-kun and the Seven Witches are streaming exclusively on Crunchyroll, where it is one of the site’s most popular titles in both formats. 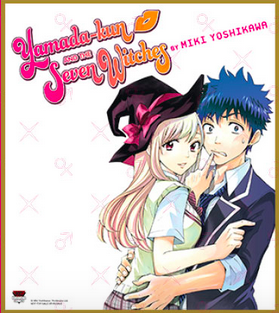 Graphic novels of Yamada-kun and the Seven Witches are published, in both print and ebook format, by Kodansha Comics.